Fatty liver or as it is also called steatosis is one of the most common diseases affecting this vital organ and in its simplest form is not a threat to its normal function. However, larger amounts of deposited fats can cause many complications, even shutting down of the organism. Because of the important processes that occur in the liver, many call it a "second brain.” It purifies the blood, keeps blood glucose levels, breaks down fats, proteins and carbohydrates, produces bile and other enzymes, and preserves the vitamins, minerals and glycogen. Unlike the situation with other vital organs, such as kidneys or lungs, in our body there is no mechanism that can take on the role of the liver - this organ is absolutely irreplaceable! This means that a disruption in its function, as well as the burden on the liver, affects the operation of the system directly connected with this organ. Burden causes a number of disorders of liver function, such as the production of enzymes (central to the work of the thyroid gland, the utilization of protein and fat burning), bile production and maintaining hormonal balance (control estrogen). For example, increase in body weight, for some reasons (and difficulty in losing weight), stomach bloating, high blood pressure, weakness and higher cholesterol levels are just some of the indicators of the workload of the liver and impaired fat metabolism. Although it is not normal for fat to accumulate in the liver, small amount will not cause any complications. On the other hand, if fat makes up 5-10 percent of weight of the body, then it is a condition is called fatty liver, which can be a consequence of alcoholism, or may not be associated with the consumption of alcoholic beverages. We all know that large amounts of alcohol are detrimental to the liver. After all, this is shown by statistical data, according to which the fatty liver occurs in 90% to 100% of people who enjoy excessive amounts of alcohol (alcoholics). 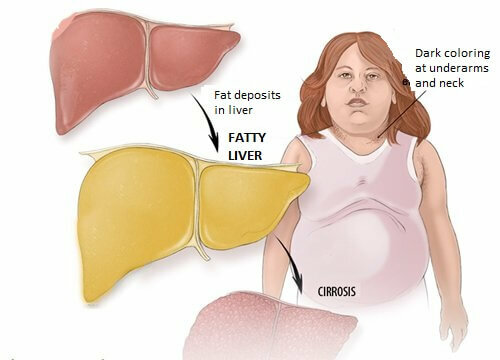 Fatty liver can also occur after moderate consumption of alcohol, even after a short period of severe intoxication (acute alcoholic liver disease). However, this disease can cause several other factors. First of all, genetics affects in two ways: it can condition the amount of alcohol that a person can consume and the likelihood of developing alcoholism. Also, genes may determine the levels of enzymes involved in the degradation of alcohol. Other factors that increase the risk of developing alcoholic fatty liver include hepatitis C, a surplus of iron in the body, obesity, poor diet. This type of liver disease in the past decade or two has become the most common cause of various chronic diseases of the body. Some people with excess fat in the liver simply suffer from what is called a fatty liver. Even though this is not a normal state, it is not serious and does not cause inflammation or permanent damage. Sometimes out of this develops nonalcoholic steatohepatitis. Even though it is easily similar to alcoholic liver disease, NASH (international abbreviation for the disease) occurs in people who drink little alcohol, or do not consume it. NASH can cause permanent liver damage, and is often manifested by increasing this organ and replacing of its cells with scar tissue, which is characterized as liver cirrhosis. In this case, we have impaired liver function and risk of cancer increases as well shutting down of its function. According to medical statistics, NASH is the leading cause of liver cirrhosis. The cause of non-alcoholic fatty liver is not yet known. Certain factors may increase the risk of the disease, or in some cases any obvious parameters that lead to disease are completely absent. However, it is known that this type of disease is usually the result of heritage and occurs in middle-aged and overweight people. In these individuals typically registered are elevated levels of triglycerides or cholesterol in the blood and they often have diabetes. Fatty liver can also be formed because of certain medications, viral hepatitis, autoimmune or hereditary liver disease, rapid weight loss and malnutrition. Also, recent studies show that excessive growth of bacteria in the small intestine, as well as other changes in the digestive system, may contribute to non-alcoholic fatty liver. In general, anything of chronic origins can impair liver function: excessive consumption of alcohol, sugar and caffeine, high incidence of pesticides and additives in food and pharmacological agents, and various toxins from the environment. The liver has to break down all the substances that get into the organism! Fatty liver is usually called the "silent disease" because it often is not accompanied by any symptoms, especially in the initial phase. In the advanced stage - for that a few years needs to pass, sometimes even decades - atypical signs such as general weakness, loss of weight or appetite, nausea, impaired reasoning power, confusion or problems with concentration may appear. In addition, aches in the central or upper right abdomen, dark spots on the skin of the neck or underarm and enlarged liver may also appear. Fatty liver symptoms in alcoholics are most often worsened after a period of excessive consumption of alcohol. While fatty liver with non-alcoholic's can be stopped, withdraws, or worsen. In cases of liver cirrhosis, liver function is significantly impaired, which is usually manifested with fluid retention in the tissue, loss of muscle mass, internal bleeding, jaundice, and liver failure. Three specific signs of liver disease are yellow skin that is discoloration of the skin (due to accumulation of bilirubin in the blood), itching, easy bruising due to reduced production factors for blood clotting and impaired function of the body. Slightly enlarged liver is determined by a routine examination, palpation of the abdomen, after which usually follow specific blood tests, first of all, the two main parameters of liver function - alanine aminotransferase (ALT) and aspartate aminotransferase (AST). Elevated levels of these enzymes indicate a problem in the functioning of the liver. In addition to that fatty liver can be detected by ultrasonic examination. However, the most accurate diagnosis is established by biopsy, which is performed when eliminating all other causes disorders of the liver. Currently there is no specific way to treat fatty liver. However, regulation or treatment of any hidden primary cause disturbance of liver function, such as diabetes, is essential. If it comes to alcoholic fatty liver disease, the most important thing is the complete cessation of alcohol consumption. In fact, this measure is useful for those suffering from non-alcoholic fatty liver. The diet with fatty liver is very important and even more necessary. Gradual weight loss (not more than half to two pounds a week) obese people can reduce the amount of fat in the liver and improve its function. Unbalanced diet and regular exercise are also helpful. Reducing fat in the diet, specially saturated ones (margarine, butter, cream) and preparing meals, with steaming, grilling or boiling in water, or with a minimal amount of olive oil, needs to be done by those suffering from this problem. Avoiding unnecessary medication is also an effective measure for withdrawal or slowing down the disease progression. Even certain minerals and vitamins in the form of supplements can cause health problems, which is why it is best taken from natural foods. Scientific research has shown that certain antioxidants and new drugs for diabetes may be useful for treatment of fatty liver. They include vitamin E, selenium, betaine, metformin, rosiglitazone and pioglitazone. In the case of complete liver failure the only solution is organ transplantation. After 20 minutes strain and drink. Dandelion tea is good for other thins except liver, to strengthen the body and detoxify the body, and can be used for washing the outside of the face and eyes. Make a tea mixture, take a tablespoon of this mixture and cover it with 2.5 dl water and leave it to stand for a few minutes. Strain and drink unsweetened. Most of these plants and substances have a protective effect on the liver, which means it can regenerate healthy cells in the body, as well as to neutralize the damage done. Fatty liver can be easily eliminated with the help of herbs. All you need is determination, patience and consultation with a physician, who will monitor your progress on the path to healing.